Bronze artifacts discovered in a 1,000-year-old house in Alaska suggest trade was occurring between East Asia and the New World centuries before the voyages of Columbus. Trade between East Asia and the New World may have occurred centuries before Columbus ever, according to a rash of new discoveries. While many have credited Leif Erikson with the first voyages to North America in the ninth century, AD, a land his crew was able to spot off the coast of Greenland, the evidence suggests that even before Erikson people had been exchanging items and ideas off the West Coast. Vikings like Erikson’s brother, Thorvald, were actually somewhat intimidated to wander too far from the coast when setting up camp, fearing encounters with the indigenous people who lived there that they referred to as ‘Skraelings,’ tribes that were likely related to the Algonquins. However, the latest artifacts, which archaeologists discovered at the “Rising Whale” site of Cape Espenberg at Alaska’s Seward Peninsula, suggest that natives living there may have interacted with Eastern civilization as well. “When you’re looking at the site from a little ways away, it looks like a bowhead coming to the surface,” said Owen Mason, a research associate at the University of Colorado, who is part of a team excavating the site. “We’re seeing the interactions, indirect as they are, with these so-called ‘high civilizations’ of China, Korea or Yakutia,” a region in Russia, Mason said. The major Rising Whale discoveries include two artifacts crafted from bronze, one of them may originally have served as a type of buckle or fastener. The bronze includes a piece of leather that the archaeologists were able to test through radiocarbon dating, which can be used on organic materials. While they plan to conduct further tests in the future, the piece dates approximately to the seventh century AD, which is approximately four hundred years before Scandinavians first arrived in North America. The second bronze artifact that the archaeologists discovered could have been used as a whistle. So aside from carbon dating, there’s another big clue here. Bronze-working had yet to be developed by the seventh century in Alaska, so the archaeologists suspect that these artifacts have likely been manufactured either in China, Korea or in fairly nearby Yakutia, and then they made their way into Alaska by means of local trade routes. The house in which these fossils were found is over 1,000 years old, and inside researchers found some other pretty exciting stuff – the remains of artifacts crafted from obsidian, a type of dark volcanic glass which is so notoriously sharp that it’s sometimes been used in recent times for crafting surgical blades. Tracing the chemical signature in these broken artifacts, they discovered that the obsidian actually came from the Anadyr River valley of Russia. 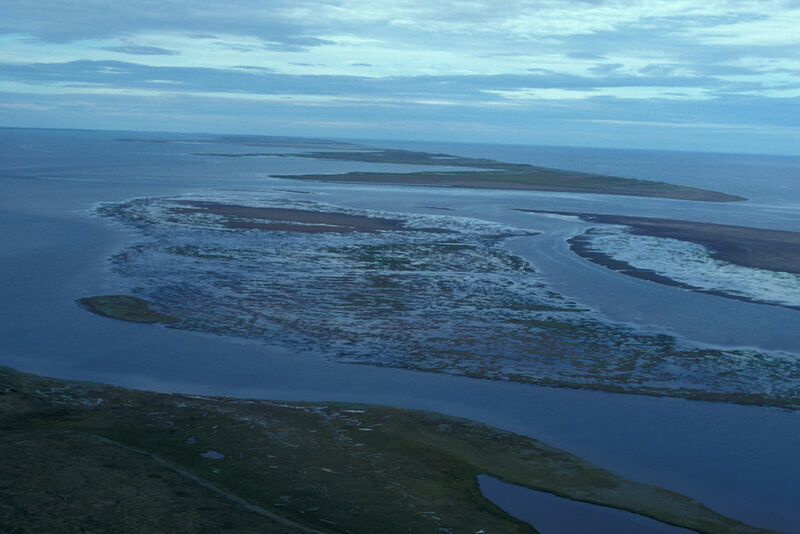 Although it has been known that people have traveled continuously back and forth from North America along the Bering Strait bridge when sea levels were low and revealed a land area approximately the size of modern Texas, these recent discoveries at the Rising Whale are the latest contributions to over a century of research suggesting that not only was the area rich in raw materials like trees and game animals, but that a number of trade routes took advantage of these regular migrations, and may have been an epicenter where a number of civilizations throughout East Asia came together, even including the Alaskan side. While we are prone to thinking of the Arctic as a barren and desolate region, it seems like the opposite may have been true at one point. In 1913, the anthropologist Berthold Laufer published his analysis of ancient Chinese texts and artifacts in the journal T’oung Pao. He observed that in China there was a great deal of interest in obtaining the ivory tusks of both narwhals and walruses, and these items were typically acquired from people who lived northeast of China. Perhaps some of the walrus ivory may have actually been obtained from the Bering Strait, where these animals have been found in abundance. In addition, a number of historians and archaeologists have also long taken note of the resemblance in design between pieces of plate armor that were worn by people in Alaska and the ones that were used in China, Korea, Japan and eastern Mongolia during the same period. He wasn’t the only one to notice some far Eastern economic staples growing plentiful in Alaska. Several decades later, in the 1930s, the Smithsonian Institution’s archaeologist Henry Collins undertook several excavations on St. Lawrence Island, located just off the west coast of Alaska. In his 1937 book “The Archaeology of St. Lawrence Island,” Collins described the plate armor found by his team, which apparently began to appear on the island about 1,000 years ago. When I say plate armor, it’s not exactly what you’d picture a night in shining armor wearing. Instead, it was made up from a series of overlapping plates sculpted out of ivory, bones and sometimes even iron. Collins already recognized plate armor of a similar nature that had been developed in several areas across East Asia, including Manchuria (a region of northern China), eastern Mongolia and Japan. The use of plate armor, he theorized, had spread northward from these areas, and after a time it was imported to Alaska from across the Bering Strait. There is also a great deal of recently conducted genetic research that also reveals the nature of interactions among people from East Asia and the New World. At present, the majority of scientists support the notion that humans first began their migration to the New World about 15,000 years ago when they crossed a land bridge that had formed across the Bering Strait when the climate was colder and sea levels were lower. The land bridge was then covered in a flood about 10,000 years ago. However, more recent genetic analysis has suggested that there was more than one movement, that these migrations of people from East Asia to the New World occurred regularly at a later date. The population who lived at the Rising Whale encampment may have been part of an elusive group of forgotten people, what scientists have called the “Birnirk” culture, a group of people who had occupied both ends of the Bering Strait and made use of sophisticated skin boats and even harpoons for hunting whales. The genetic study currently indicates that these people of the Birnirk culture are in fact the ancestors of a people known as the “Thule,” a tribe that spread out across the North American arctic as far as Greenland and encountered Thorvald Erikson and his men. The Thule, in turn, are actually the ancestors of the modern-day Inuit. While the Bering Strait may have been a rather important trading post on the West Coast and the Vikings established a short term settlement at L’Anse aux Meadows in Newfoundland in Canada, the Americas may have had other early occupants as well, this time reaching south. There is further research to indicate that, around the same time as the Viking settlements, the Polynesians had reached South America, discovering sweet potatoes which they brought back with them to Polynesia. In return, they may have brought chickens with them to South America, which are the ancestors of a tropical bird. There have been countless other hypotheses put forward to suggest that people had reached the New World long before Columbus did – one even going so far as to suggest that Native Americans arrived in ancient Europe during the time of the Pax Romana. Another popular suggestion is the possibility that Chinese mariners once sailed directly into the New World. Both ideas largely lack scholarly support and evidence, aside from the fact that the ideas were within the range of possibility. Mason and his team are going to present their new research of the Rising Whale site later this week at the Canadian Archaeological Association annual meeting, which will take place at St. John’s Newfoundland, Canada, between the dates of April 28 and May 2.